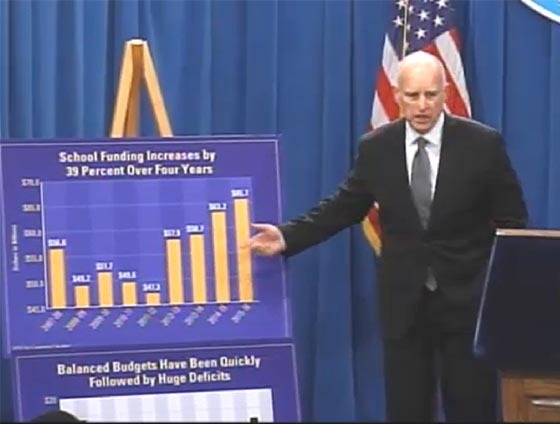 Here is a quick rundown of the highlights from Governor Jerry Brown’s proposed budget for 2015-16 as it relates to K-12 education. Between Proposition 30 tax revenue and an improving economy, K-14 education in California is looking to win big in Gov. Jerry Brown’s proposed 2015-16 budget. Overall, K-14 could see a $7.8 billion increase in spending for the 2015-16 fiscal year. Proposition 98 could see a 4 percent increase from 2014-15 levels, raising education revenue from that source to $65.7 billion. Higher than expected General Fund revenue could also add $2.7 billion more in Prop. 98 money for both the 2013-14 and 2014-15 fiscal years as well. During the recession, the state deferred almost 20 percent of annual payments to schools, according to the proposed budget. Some school districts borrowed money to cover costs. The Budget proposes repaying the remaining $992 million owed to schools and community colleges. 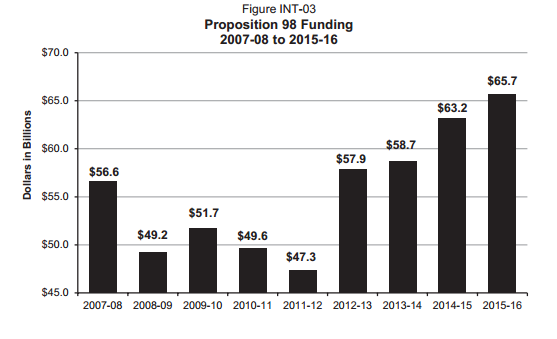 Under the proposal, $1.1 billion would be allocated in “discretionary” one-time Proposition 98 funds for the broad goal of furthering investments to implement new academic standards: Common Core, the English Language Development standards aligned to Common Core and California’s Next Generation Science standards. It would also support new responsibilities required under the Local Control Funding Formula. The budget proposal includes $33.6 million to expand state preschool programs as promised in the 2014-15 budget. The funds would cover 4,000 full-day, full-year slots for low-income 4-year-olds. Of those funds, $14.8 million come from Proposition 98 funds. The 2014-15 budget also promised to add 31,500 slots in upcoming years, eventually covering half of California’s 4-year-olds. Although Kong said she understands that the state might not be able to fund all 32,000 slots in one year, she said she hopes to convince the governor and Legislature to increase the amount this year to $110 million for 10,000 more slots. The proposed budget would allocate $500 million for the Adult Education Block Grant, which includes dedicated funding for one more year for K-12 adult education programs. The proposal also sets up a process by which the California Community Colleges chancellor and the superintendent of public instruction would determine distribution of the funds by region. Local consortia — made up of K-12 programs, community colleges and other organizations — in each region would then decide which programs to fund. During the budget press conference, Brown briefly touched on the issue of teacher tenure. A Los Angeles Superior Court judge ruled the current teacher protection system unconstitutional in his 2014 decision in the Vergara lawsuit. Following up on $26.7 million in one-time spending to improve Internet connectivity and infrastructure at schools, Brown proposes an additional $100 million in one-time spending to better prepare schools for computer-based testing that will be part of Common Core. As EdSource has reported, many schools in California still lack the broadband infrastructure to effectively administer these computer-based tests. Under the proposal, an additional $4 billion could go toward funding school districts under the Local Control Funding Formula, an increase of 8.7 percent from last year. After the implementation of the Local Control Funding Formula eliminated most categorical funding programs, Career Technical Education programs lost out, specifically Regional Occupational Centers and Programs. As a result of the 2013 and 2014 Budget Acts, $250 million was distributed each year through the Career Pathways Trust Program. Over the next three years, the budget proposes spending an additional $250 million each year on a transitional Career Technical Education Incentive Grant program that, unlike the Career Pathways program, would require a dollar-for-dollar match by school districts, charters and county offices of education that receive funding. Also, priority would be given to local agencies that work with one another on regional programs. State Board of Education President Michael Kirst said the governor’s proposals represented a “new vision” for career technical education by not making these programs a sole K-12 responsibility, but by encouraging collaboration with other local agencies, as well as the formation of regional partnerships. Brown is proposing a major change in how school facilities are funded. Under the current system, local districts can access state bond money on a matching basis. Brown wants to eliminate state assistance for all districts except those that do not have enough property wealth to be able to finance new facilities on their own. Kirst said that the governor’s proposals would bring school construction funding much more in line with the Local Control Funding Formula by targeting state money to school districts with the greatest financial need.